RAYNHAM - Raynham-Taunton Greyhound Park has been on the decline since it set a world record for collecting $240 million in dog racing revenue in one year, back in 1989. 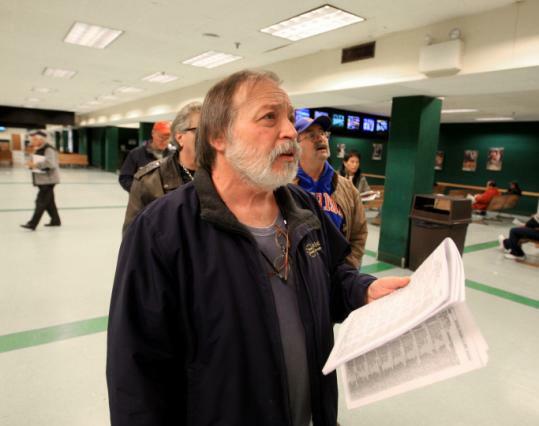 The 69-year-old Raynham track hasn’t been a significant moneymaker for owner George Carney since the 1990s, when casinos and slot parlors began drawing the betting crowd down to Connecticut and Rhode Island. A statewide ban prohibiting live dog racing goes into effect Jan. 1 and the track announced its last live race is Dec. 26. Attendance at Raynham, where enthusiasts stood 30-deep to watch live racing back in the 1980s, has thinned to small groups of gamblers who track races via simulcast monitors. The elderly, who still come to the park in Raynham daily, tend to prefer live racing. That schedule has been cut back in recent months as kennel owners, in anticipation of the ban, move their dogs to other states. Carney, 81, a feisty businessman who fought hard against the racing ban prior to its approval in 2008, now says it’s time to let it go. That next venture is installing slot machines at the track, which Carney hopes will be approved by state legislators as part of expanded gaming sometime early next year. “I feel I can make it successful and take care of all the people here,’’ he said. The track will continue simulcasting races from other racetracks until July 31, 2010. The state’s only other dog track, Wonderland Greyhound Park in Revere, ran its last live race in September, but still offers betting on simulcast races. About one-third of the Raynham-Taunton track’s 600 full- and part-time employees will be let go at the end of the year, track officials said. Longtime track general manager Gary Temple is already out on what he labels “a sabbatical,’’ but he said he hopes to return if slots are approved. Sharon Butts, who has worked at the park for 26 years, said she still isn’t sure whether she’s on the layoff list. Her schedule has already been trimmed. Customers, Butts said, really don’t understand what is going on. “People still can’t believe we’re not going to have live racing here,’’ she said. Elsie Sanford comes to the track as often as five times a week, meeting a group of friends there, including Edith and Bill Qualters, who adopted a greyhound named Sandy, who once raced at the track. While most of the dogs are being sent out of state to run, some are being adopted, Carney said. His son Christopher is working with GREY2K USA and the MSPCA - two agencies that vigorously promoted the racing ban - on placement of dogs. But the trainers are doing most of the placement, the elder Carney said. Carney, who first started working at Raynham in 1942 for $4 a day, leading greyhounds out to the starting line, purchased the Raynham-Taunton Greyhound Park in 1966. He plans to watch the last live race when it is run on Dec. 26.